2.0L Gasoline Engine 1. Power steering fluid reservoir 2. Engine oil filler cap 3. Brake fluid reservoir 4. Air cleaner 5. Fuse box 6. Negative battery terminal 7. Radiator cap 8. Positive battery terminal 9. Auto transaxle oil dipstick (if equipped) 10. Engine oil dipstick 11. Engine coolant reservoir 12. Windshield washer fluid reservoir The actual engine room in the vehicle may differ from the illustration. 2.7L Gasoline Engine 1. Power steering fluid reservoir 2. Engine oil filler cap 3. Brake fluid reservoir 4. Air cleaner 5. Fuse box 6. Negative battery terminal 7. Radiator cap 8. Positive battery terminal 9. Auto transaxle oil dipstick (if equipped) 10. 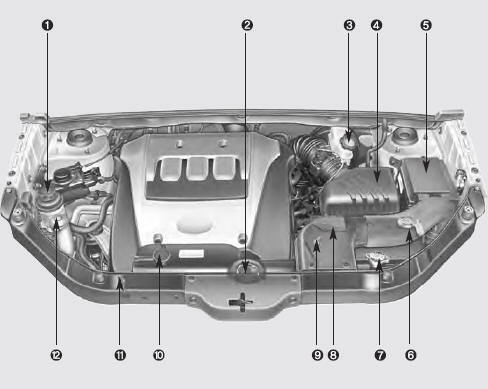 Engine coolant reservoir 11. Engine oil dipstick 12. 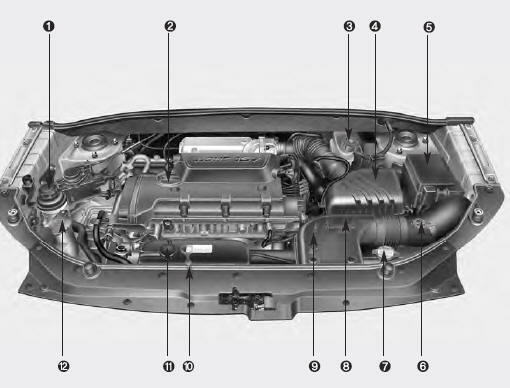 Windshield washer fluid reservoir The actual engine room in the vehicle may differ from the illustration.